Go on, have a slap. 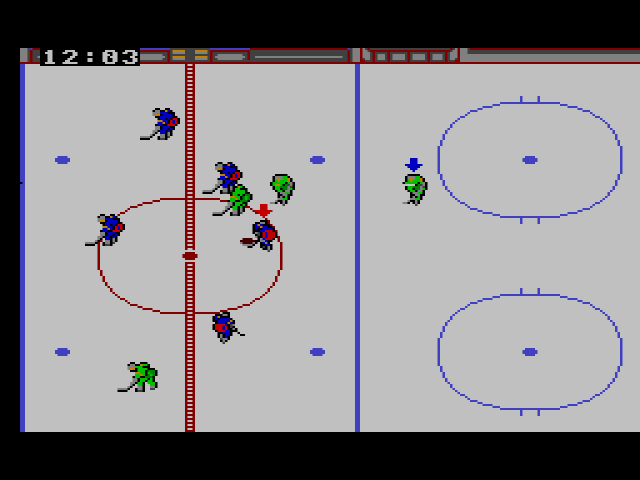 Prior to Slap Shot, Sega had released exactly two hockey games for their console: Champion Ice Hockey for the SG-1000 and Great Ice Hockey for the Master System. Both were mediocre upon release, which means they’re all but unplayable now, as most 8-bit hockey games not named Ice Hockey and Blades of Steel are wont to be. 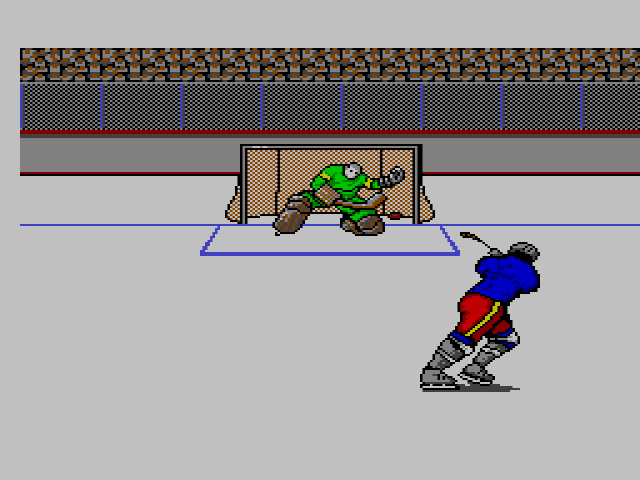 Slap Shot doesn’t atone for the previous hockey titles’ sins, but compared to Sega’s earlier works, it’s playable. The sprites aren’t very pretty, but they move fast on the ice. And just in case you think Slap Shot might be related to the 1977 Paul Newman film of the same name, stop thinking that. It’s just not true! 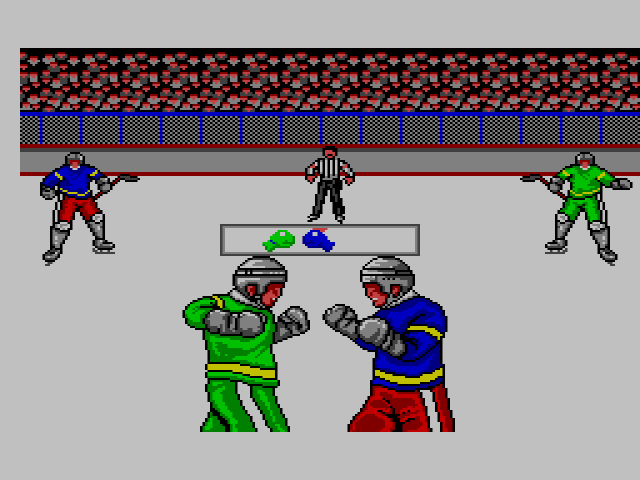 Not only is Newman’s aging coach Reggie “Reg” Dunlop nowhere to be found, but according to Sega Retro, the game was called Slap Shoot in development. 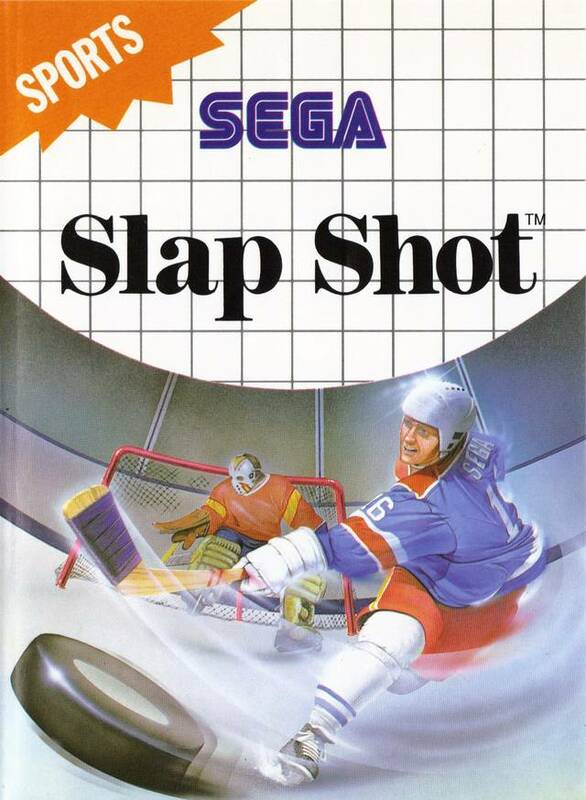 Slap Shoot sounds funnier, sure, but no self-respecting human being would unironically purchase anything named Slap Shoot. Besides, with Slap Shot as the title, you can trick people into thinking they’re buying a video game adaptation of their favorite hockey movie. Jason moonlights as a goalie between “Friday” films. Exhibition and Tournament are the modes here. An exhibition match is a one-on-one stick royale against another country from a specific league, A, B, or C; C = amateur, B = decent, A = no way you’ll beat this team. A friend can join in for extra fireworks, but don’t invite him over for the Tournament. The latter is a strict one-player affair that serves up all the pucks you can handle. Seriously, you better love you some hockey to commit to nine straight games. Pretty sure nobody in North Korea is that happy. Once you and your boys skate onto the rink, the ref plops the puck in the middle and off you go. The controls are close to flawless. The players move seamlessly in eight directions, while passing and shooting are always intuitive. 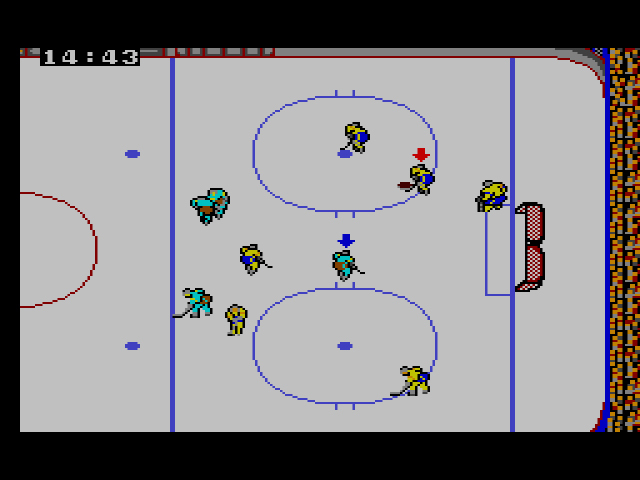 If the other player’s team bonks into a player a couple times, they’ll lose control of the puck and spin out on the ice. Occasionally, a fist fight will erupt. Mash buttons 1 and 2 as hard as you can or else you’ll be assigned to the penalty box for two minutes, game time. Good golly, more stick twiddling. Each game is three rounds of twenty minutes. That’s twenty minutes game time, not real time, thank God. Despite Slap Shot‘s general competence, I still found it hard to see a game through to completion, due to its lack of personality. Despite having a wide array of teams (with bizarre looking coaches), each team looks and plays like the same group of goofy white guys from Canada (even North Korea), just with different colored attire. And while there is quite the difficulty leap when you play a team from the amateur league vs. professional league, Slap Shot never feels difficult if you know the basics. C’mon, North Korea, pummel that bourgeoisie oppressor! If you’re a hockey fan who likes retro games, you’ll get a few good rounds out of Slap Shot. It’s always amusing to play as countries that don’t exist anymore, and you can’t argue with the game’s fantastic controls. Don’t expect anything deeper than the ol’ slap-and-pass, and you’ll be fine. Just did some reading on the North Korean hockey team, turns out they’re not as dreadful as you might have imagined. Just like this game! North Koreans are pretty awesome, actually. I would love to go there and learn about their country from the common people without fear of getting thrown into a gulag, but alas.